A dragonfly perches upon a dusty crimson and white lotus blossom. Shades of greens, including pale mint form the opened lotus leaf as it extends beyond the circular design. 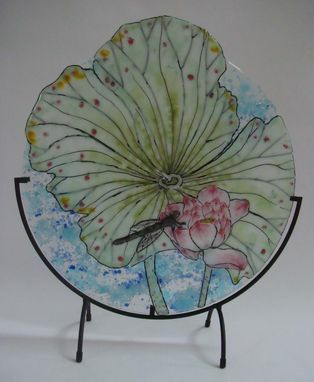 This glass fused artwork can be wall mounted or stand displayed. Glass- 15" x 16 1/2"
Glass in Stand- 16" x 18 1/4" x 5 1/2"